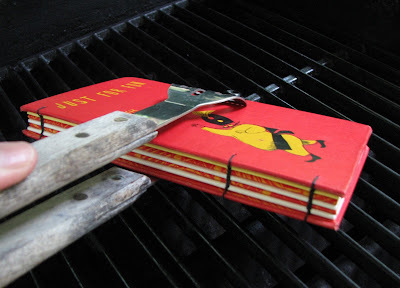 Summer is winding down in some places and a distant hope in others, but members of the Etsy Bookbinding Street Team are ready to celebrate the hottest season by hosting a Virtual BBQ Scavenger Hunt. Next weekend starting Saturday, August 1, through Monday, August 3, browse participating shops and locate hidden photos of items associated with the venerable tradition of the summer backyard barbecue. Not sure what that means? No worries! We'll provide a list of items so you'll know exactly what you're looking for. Find them all and enter to win a $30 gift certificate good at any participating shop. AND win bonus chances to win with each item purchased from participating shops during the hunt! Come back next Friday, July 31, for a list of participating shops and complete details. Just follow the smoke!